India’s government called Tuesday for the country’s political parties to reach consensus on drafting anti-corruption legislation, as an activist leading anti-graft protests entered the second week of his hunger strike. Prime Minister Manmohan Singh’s government scheduled an all-party meeting for Wednesday to discuss details of setting up an anti-corruption watchdog. The move follows a week of protests drawing tens of thousands chanting support for activist Anna Hazare as he vows to fast indefinitely until lawmakers create an ombudsman with authority over the judiciary and prime minister’s office. Hazare has argued that the government’s bill tabled in parliament earlier this month is too weak. The 73-year-old Hazare — styling himself after Indian freedom fighter Mohandas K. Gandhi — has called his campaign a “second revolution” and drawn comparisons to India’s fight for independence in 1947 from its former British colonial rulers. Tuesday’s crowd was a fraction of what that turned out over the weekend and on Monday, which was a holiday in India. Hazare’s aides said he is weaker after losing more than 5.5 kilograms since beginning the fast Aug. 16. Hazare reassured his supporters that he faced no threat. “I trust my team of doctors. They will not let me die,” he said. Authorities are required to intervene if Hazare’s life is at risk, as suicide is illegal in India. Some have criticized the hunger strike as undemocratic and verging on demagoguery, saying Hazare was falsely claiming to represent all of India. 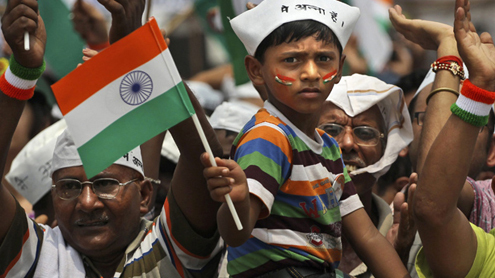 Critics have also objected to Hazare’s proposed version of the ombudsman bill as unconstitutional. Representatives of India’s lowest-caste dalits, or untouchables, planned their own protest against Hazare’s proposal on Wednesday, saying it offered little to protect the country’s poor masses. But Hazare’s basic focus on rooting out corruption has struck a chord among Indians fed up with bribery and favoritism in all levels of government. The Indian media has given nonstop coverage to his campaign, while supporters hold rallies in cities across India. Meanwhile, Parliament was forced to shut down its morning session amid shouting by lawmakers from the main opposition Bharatiya Janata Party demanding Hazare’s protest demands be discussed. While both the opposition and governing party have been implicated in major scandals over the past year, opposition leader Sushma Swaraj blamed the government for the country’s graft and said “ministers are looting” millions of rupees.